We’re planning a Super Bowl Sunday Sew-a-Long over at the About.com Quilting Forum. 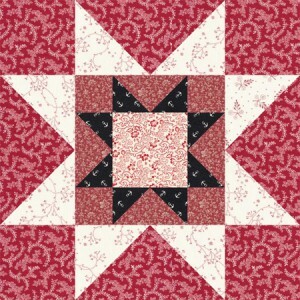 One of the quilt blocks chosen for that event is Straight Patch Nine Furrows, a design that I’ve always called Split Nine Patch (it has other names, but don’t they all). Misha, my Forum Hostess, suggested the block because it’s made with a combination of squares and half square triangle units — perfect for scrap quilts. So the ladies (we don’t have any gentlemen members right now) have been digging into their stashes to find already-assembled triangle squares (so much easier to type) and fabrics they’d like to use for both those units and the plain squares. 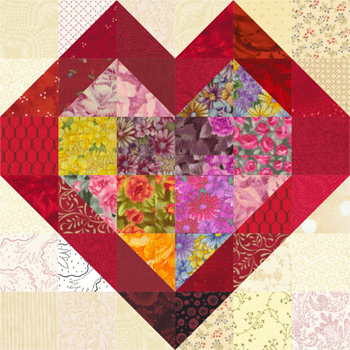 I’ve been fooling around with different layouts for those two patchwork shapes, and the Double Hearts quilt block is one result. And timely, since we’re getting very close to Valentine’s Day. 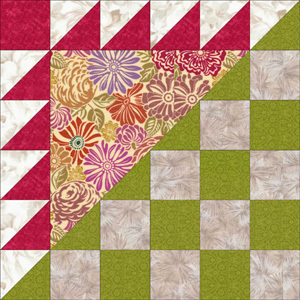 The triangle square units are easy to make and squares are a cinch to cut. Grab your stash and look for patches you’d like to sew into a heart — they needn’t look like mine. 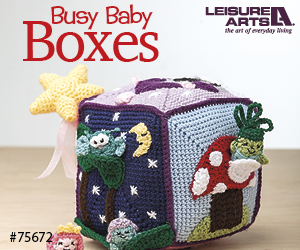 You’ll find cutting and complete instructions for four block sizes, from 6″ x 6″ to 15″ x 15″. I wrote this easy Dresden Plate quilt block pattern for Joy, one of the hostesses in our Quilting Forum — she’s hostessing a swap for the scrappy quilt blocks. Don’t worry about turning under the points of those blades as you work — not going to happen. 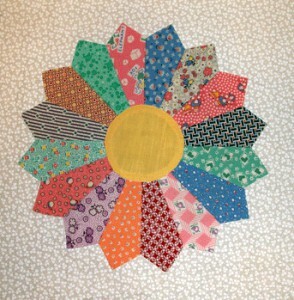 This easy Dresden Plate method zaps that task away and makes it easy as pie to sew the blocks. Follow Joy’s guidelines if you’d like to be in the swap, or use a totally different set of fabrics if you plan to work on your own. 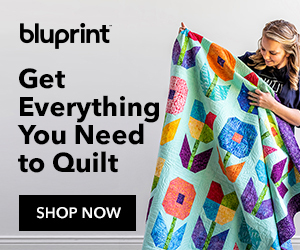 And you know what… this is so easy that you might just find yourself making multiple Dresden Plate quilts. I’d love to see one made with bright fabrics against black or navy blue. Or in the watercolor style, with florals that melt into each other. Or maybe even with batik fabrics. 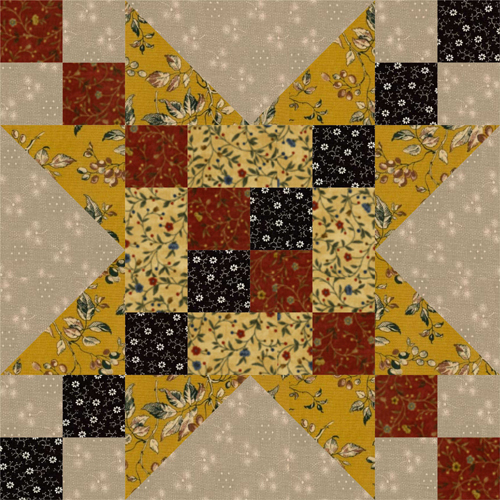 Quilt blocks finish at 12″ x 12″. The pattern is ready to go now, but our Quilting Forum members are getting together for a Scrap Quilt Sew Along on Super Bowl Sunday, February 2nd. The quilt block is easy, and you’ll find there are plenty of options. Choose any block size that suits your scraps and play with the layout — there are loads of possibilities. Thanks for Misha for the variations shown here — they’re a fantastic preview of design choices. Country Roads is a quilt block pattern you’ll find on my About.com Quilting site. It’s super easy — all straight-grain patches that are beginner friendly (but with enough layout variations to make the design interesting to quilters of all skill levels). Choose entirely different colors and colors values to change the design in any way that suits you, and go completely scrappy if you like. Call them wonky or call them freehand, but not matter what they’re called these log cabin blocks are easy as can be to sew. No templates and no precise cutting… just grab a background and some strips of fabric and sew. Your blocks might look entirely different than mine, and that’s fine, the more unique the better. 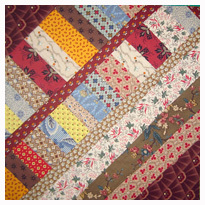 The log cabin blocks are sewn using simple string quilting techniques, and you’ll find the pattern at my About.com Quilting website. String quilting is a super easy technique that’s absolutely perfect for a scrap quilt. Even though their fabrics vary, string layouts can be somewhat structured, like the block shown here, or sewn in an entirely random way. 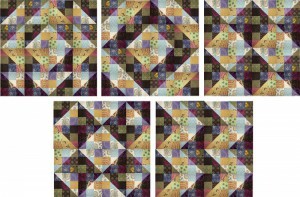 String blocks can also be cut into triangles (or other shapes) after sewing to create lots of variety when they’re re-assembled into a quilt. The pattern for this quilt block is published on my other quilting web site, About.com Quilting, along with general instructions to help you create additional string projects. 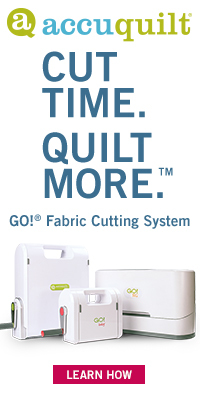 Give the technique a try the next time you want to make a simple, stash-busting quilt. Squares and rectangles, and a bit of quick piecing — that’s all it takes to create this 12″ Rising Star quilt block. The design is one of many from the Evening Star realm, also called Sawtooth Star. I’ve included a couple of quilt layout options to help you choose fabrics for multiple quilt blocks. My red and white block has an orderly color arrangement, but get as scrappy as you’d like when sewing the stars. Basket quilts are year-around favorites, but there’s something special about creating colorful baskets geared specifically for spring and summer. Most basket designs give your half-square triangle skills a workout, but not to worry, because those units are easy to sew with quick piecing techniques. Another plus — baskets look fantastic made with leftover scraps, so raid your stash and start sewing.